Ranjha Ranjha Kardi Episode 11 Story Review – This latest episode of Ranjha Ranjha Kardi had more of Bhola than any other character. All the scenes covering Bhola showed a different aspect of his life. The helpless and dejected Noori the viewers saw in the previous episode is gradually fading away and by the end of this episode, Noori finally reacted to everything which was happening to her. This episode also had some of the most solid performances to its credit. Imran Ashraf deserves tons of praise for translating an extremely difficult character effortlessly on screen. He has brought Bhola to life in the best way possible. Iqra Aziz acted brilliantly tonight, her expressions and body language especially in the scene at the mazar were superb. The downside of this episode was that Noori and Bhola did not meet, something which everyone was eagerly looking forward to. The best part of this drama is that every single situation has been written down and executed in such a realistic manner. Tonight’s episode opened with an upsetting event. The people Bhola calls his friends are actually bullies who enjoy making fun of Bhola. These were the same men who Noori met when she came looking for Sahir, once they see Noori’s picture they will recognize her. It is really common for people like Bhola to be bullied in the insensitive manner in which Bhola got bullied tonight and the fact that Bhola considered these people his friends definitely resonated with me. Having ‘friends’ is normal and saying that these people are his friends makes Bhola feel like he is like everyone else. This incident also showed that Bhola did not like who he was which is why he did not want his dulhan to be like him. Even though there were a lot of scenes later on which showed a more funny side of Bhola’s character yet I felt for him in every single scene. The chacha giving sleeping pills to get him off his back was a really important scene. Did his mother know that Bhola was being given these pills? Bhola’s chacha is a suspicious character right from day one since he is a little too calculating and he never really shows what is going on in his mind. Bhola’s dialogues about what his chacha said to him when his father died were also meaningful. Bhola is afraid of losing people ever since then and even though he hasn’t even met his dulhan, he is afraid he might lose her. Bhola’s attempts to do what normal people do and to be like them makes you feel for his character. 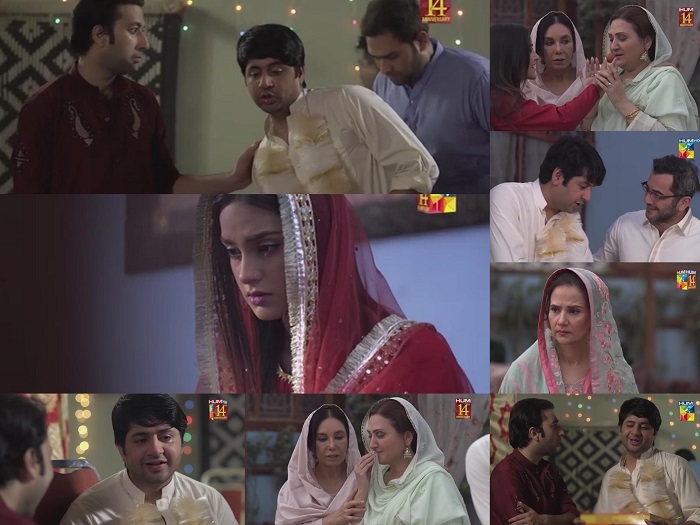 Noori’s state of mind was shown brilliantly in this episode. When her groom did not turn up on the wedding night, Noori was confused and the toys in the room confused her even more. Although, Komal did say Bhola Bhai in front of her but Noori it seems did not hear that so even now she has no idea who is her husband. The scene at the mazar was one of my favorite scenes in this episode since it showed a side of her character which has been repeatedly been asserted in all the episodes. Noori’s hatred for everything dirty was the one side of character which stood out more than any other when her character was introduced therefore the fact that the visit to the mazar made her so upset was relatable. Iqra Aziz’s overall look has always been right on point in this drama. Tonight for the first time Noori wore nicely stitched pretty clothes and she looked completely different. Noori however has never been shown as someone who wanted to get married to someone rich so that she could afford better clothes and jewelry. But the overall look went well with this new change in her life. Iqra Aziz’s expressions were spot on in the scene at the mazar and in the last scene of this episode. Ranjha Ranjha Kardi is an exceptional play with some amazing performances which leave you spellbound. Imran Ashraf has already proved his mettle as an actor but he has surely outdone himself this time around. This drama however is a game changer for Iqra Aziz who is getting a chance to showcase her true talent for the first time. Noori and Bhola both are deep and layered character, I am waiting to see them both together in the upcoming episodes. All the performances tonight were faultless and like every other episode of Ranjha Ranjha Kardi all the scenes were short and to the point. Asma Abbas is such a remarkable actress, I especially love her in this role. It is always great watching a drama in which the entire team has put in their best efforts. How many of you watched this poignant and entertaining episode of Ranjha Ranjha Kardi? I am eagerly looking forward to the next episode because next week Noori will finally find out that Bhola is her husband – waiting to see her reaction.